Born in Dublin, Ireland, (a U.S./Irish dual citizen), Derek Gleeson studied piano, percussion, composition and conducting at the music conservatories of Dublin, London and Vienna, and film scoring at the University of California, Los Angeles. By the age of 11, Gleeson was the recipient of many piano and percussion competition prizes within Ireland and Great Britain. At the age of 15 he was selected to represent Ireland as an orchestral musician in the European Community Youth Orchestra, where he had the opportunity to perform at the great European music festivals, such as Salzburg, Edinburgh and Lucerne Festivals under Maestros Herbert von Karajan, Claudio Abbado, Leonard Bernstein and Sir George Solti. 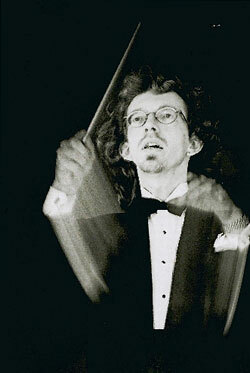 These early experiences moved him specifically toward a career in conducting. In 1984 he was a prize winner in the Shell/London Symphony Orchestra music scholarship program. As a freelance musician, Gleeson performed with most of the British orchestras, including The London Symphony Orchestra, the BBC Orchestras, the Bournemouth Symphony Orchestra and the Chamber Orchestra of Europe, as well as European jazz and pop ensembles (e.g., EuroJazz, NYJO, and Clannad) before directing his time exclusively to conducting and composition in 1989. He was Music Director of the Ruckert Orchestra of Dublin (1990 through 1993), and since 1997 he has been Music Director of The Dublin Philharmonic Orchestra. An ardent champion of contemporary music, Gleeson has provided many premier performances of works by living composers, his own works also being performed in Europe and the U.S. In 2004, Gleeson’s concert work titled “Buenos Aires” premiered in Buenos Aires, Argentina. His recordings as conductor include premieres of contemporary American and Irish composers with The Dublin Philharmonic Orchestra and Philharmonia Bulgarica. Derek Gleeson has conducted the premier CD recording of Tchaikovsky’s oratorio, Ode To Joy, The Original Romeo & Juliet Fantasy Overture, and Prokofiev’s Zdravitsa with The London Philharmonic Orchestra and Choir, (Carlton Classics/IMP Masters). Amongst others, Gleeson has conducted The London Philharmonic Orchestra, the RTE Concert Orchestra (Ireland’s national broadcaster), The National Symphony Orchestra of Ireland, The Dublin Philharmonic Orchestra (Ireland), Orchestra Da Camera Fiorentina (Italy), The Brohuslav Martinu Philharmonic, Karlovy Vary Symphony Orchestra, and Philharmonic Orchestra Hradec Kralove (Czech Republic), National Ballet of China Symphony Orchestra, Orchestre Symphonique de Bretagne (France), RTL Orchestra (Luxembourg), NOS Orchestra (Holland), The Ruckert Orchestra (Ireland), Szombathely-Savaria Symphony Orchestra (Hungary), The Danish Radio Concert Orchestra (Denmark), Orchestra of the Sadlers Wells Royal Ballet (England), Bulgarian National Radio Symphony Orchestra, Philharmonica Bulgarica, The Vratza Philharmonic, Plovdiv State Opera and Bourgas Opera/Philharmonic (Bulgaria), The Los Angeles Composers Guild Chamber Orchestra, and the Tehran Symphony Orchestra (Iran). Gleeson’s opera repertoire includes performances of Verdi’s La Traviata, Il Trovatore and Rigoletto, and Un Ballo in Maschera, Mozart’s La Nozze di Figaro, Don Giovanni, and Magic Flute, Bizet’s Carmen, and Tchaikovsky’s Eugene Onegin. Gleeson conducted Rigoletto for the Anna Livia International Opera Festival in Dublin. Gleeson recorded the first Gaelic rendition of Prokofiev’s Peter & The Wolf. He conducts The Dublin Philharmonic Orchestra (“DPO”) in Carolan Suite on Patrick Cassidy’s CD, Deirdre of the Sorrows (BMG/Windham Hill), and with The DPO recorded and conducted American composer Don Ray’s orchestral suite, Family Portrait and the premier recording of Ray’s Concerto for Piano and Orchestra with Philharmonia Bulgarica, released on Albany Records. He recorded Ray’s Homestead Dances with The DPO, released on Albany Records in 2007. In 2009, as Music Director and Conductor, Gleeson and The Dublin Philharmonic Orchestra embarked on its inaugural United States ten week tour of 49-cities in 24 states, presented under the auspices of Columbia Artists Management, Inc. In July 2010, Gleeson and the all-Irish DPO toured China, performing at the Shanghai Grand Theatre’s World Expo Program, and two concerts opening the Beijing Festival summer season at the National Centre for the Performing Arts at the Opera House, televised throughout China to over 400 million people. The Orchestra returns to China in 2014/2015. Future tours include Germany, France, Switzerland, Austria. Gleeson composed film scores for the feature films The White Pony (Director Brian Kelly), Irish Whiskey (Director Jon Stevens), Moving Target (Director Paul Ziller), The Doorway (Director Michael Druxman), Kitchen (Director Kieron Walsh) and additional music for The Suicide Club (Director Rachel Samuels). 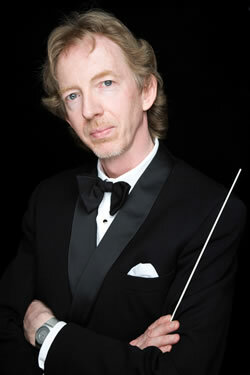 In addition to composing music for film, Gleeson is Director of Screen Training Ireland's Film Scoring Program, Dublin. He served as Composer Advisor to Moonstone International (sister company to Sundance Festival) and as Jury Chairman of the Irish Film & Television Awards (IFTA). Gleeson is the Designer and Program Director for Ireland’s first MA program studies in Scoring for Film and Visual Media, in association with Dublin Institute of Technology Conservatory of Music/Pulse College/Windmill Lane Recording Studios. Copyright © The Dublin Philharmonic Orchestra. All Rights Reserved.